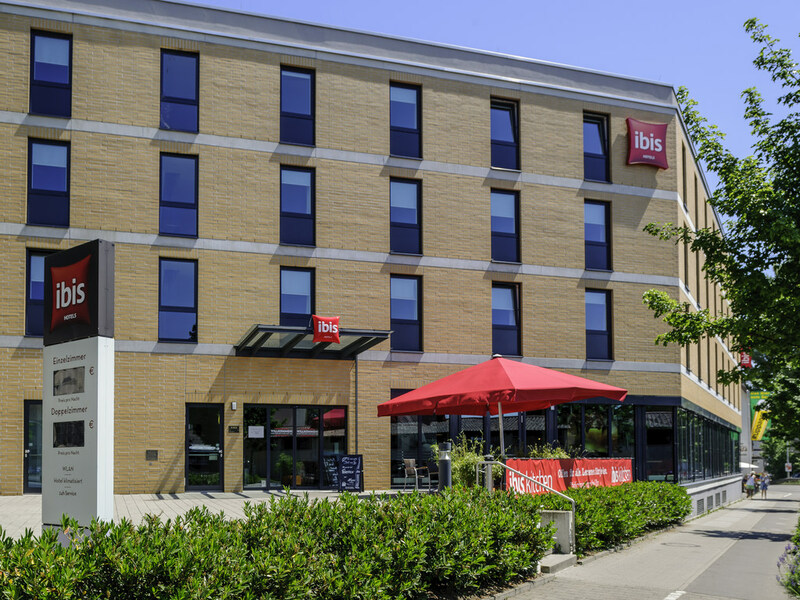 Hotel ibis Konstanz. Book your hotel now! Free Wifi! The newly-built 2-star Ibis Hotel Konstanz is centrally located, just three minute's walk from Lake Constance. The hotel has over 115 soundproof, air-conditioned rooms and family rooms in addition to three seminar rooms. Take advantage of our 24-hour service, generous breakfast times from 4 am to 12 pm and free Wi-Fi. A playground, beach, swimming pool and public car park are all located in the immediate vicinity, while the old town offers the ultimate shopping experience. Relax and enjoy. Have a snack or drink... The ideal meeting place for food-lovers, colleagues and friends. The receptionists were very friendly. I had forgotten my alarm clock in my room. After my phone call, they sent it back to my home together with a personal greeting and a little chocolate. Very nice! Comfortable, clean rooms and hotel has a modern and well designed image. Employees were friendly and always willing to help. TV screen could be a bit larger. The reception service was really great, room very clean a spectacular breakfast! Absolutely overloaded internet connection. Not possible to make use of WiFi during peak hours in the evening. Room ok, clean. Super friendly and helpful staff, reception, housekeeping. Enhanced my stay a lot ! Clean, apart from the toilet could have been brushed better. Good: fast check-in, comfortable bed, and the man at the counter (around 8 pm) was friendly and helpful ( the 2nd evening he even remembered how I drank my coffee) Bad: Both glasses in the bathroom were dirty (the man at the counter gave me replacements from the bar because he didn't know where the glasses for rooms were), the hotel brochure was covered with ink scribbles (no replacement for that), TV angle is not adjustable (it's at an awkward angle for watching from the sofa) Very annoying: the woman doing check-out (around 7 am). First, she went on chatting with a colleague at the bar, then she completely ignored me and helped the man who came in after me. After a bit, I had to interrupt because I needed to get to work. When I asked whether I could just put my key card in the box, she nodded, but when I tried to ask for a copy of the bill, she turned her back to me and continued chatting with the man. I never received a copy of the bill, neither there nor by email, as the woman was not inclined to help me -- neither when I was there nor afterward. Good Day Ms. V., it saddens us to hear that your experience during your stay in Konstanz is not what you have hoped for. We have taken the matter further with the employee who was on shift that morning of the day of your check-out. We generally do not have a policy that men come first before women, we assist every guest equally. We apologise for any inconvenience caused in this matter. With Kind Regards from Lake Constance Ibis Hotel Konstanz Front Office Team. I have staid here for the third time, the staff is always friendly and competent, the rooms always clean and all services excellent. Excellent service, clean comfortable rooms. The service was really good and breakfast was served for a long time so it meant we didn't have to get up at the crack of dawn as in some hotels. Bianca on reception was particularly helpful, providing bus route advice and places to go. Very good room, clean. Position excellent (central) good breakfast buffet in the morning. Parking in the premises. Good location, hospitality good. Staffs very helpful. However, limited facility and no family room.